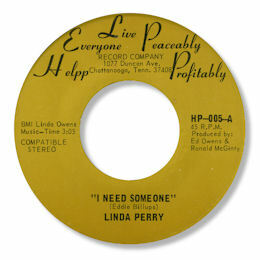 Linda Perry first recorded for HELPP (“Help Everybody Live Peaceably Profitably”) a label from Tennessee in which that very interesting character Eddie Billups was heavily involved. The dead slow Billups ballad I Need Someone has an undeniable power despite its low key production values and small band backing, due largely to the highly charged lead vocal. You can almost touch Linda’s desperation so emotionally hyped does she sound. 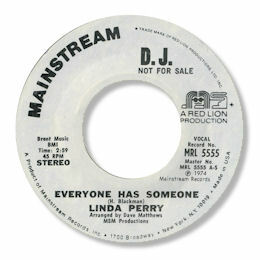 The track was picked nationally by Mainstream who also put out a second single on her. “It’s All In The Back Of Me Now” has become a firm dance floor favourite but Everyone Has Someone is a far more convincing performance. I really like the doo wop influences from the chord structure and the backing singers but what makes this special is Linda’s gospel tinged wailing. Really fine singing.